Vittorio Cerea, and his wife Bruna, opened the original Da Vittoria in 1966. 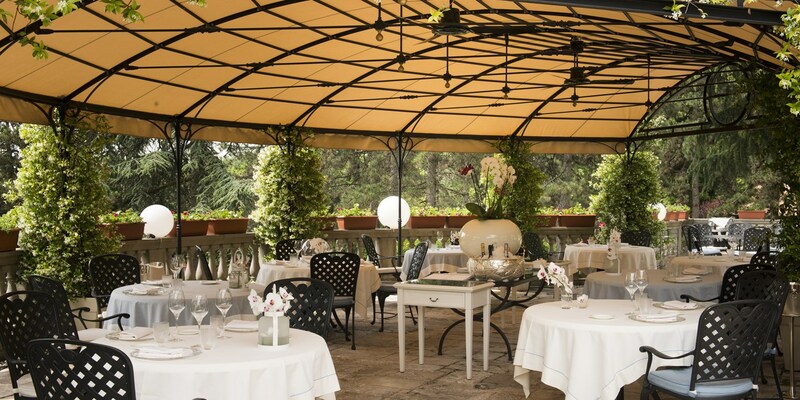 This original incarnation of the restaurant was situated in Bergamo city centre; just north of the chaotic centre of Milan, and just below the start of the Bergamo Alps and the beautiful Italian lakes. In the early days, the restaurant built its reputation around their creative fish dishes, taking a gamble at a time when meat was dominant on restaurant menus. Perseverance paid off, with the first Michelin star awarded to the restaurant in 1978, the second in 1996, and the third in 2010. During this time the Cerea family grew, with Vittorio and Bruna introducing their five children to the culinary world; Enrico, Roberto, Francesco, Rossella, and Barbara. 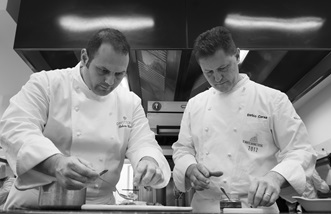 Recently, the restaurant has changed both location and senior management, with chefs Enrico and Roberto taking the lead roles at the new villa at Brusaporto in Lombardy, slightly further out from Bergamo in the Cantalupa hills. This new venue provides the perfect tranquil setting to enjoy both a stay in the luxurious accommodation, and the exquisite food in the restaurant. The villa comprises of vast grounds with two lakes, a swimming pool, sporting facilities, an open dining terrace, and ten rooms as part of the hotel. With ornate chandeliers, decorations gilded with gold, and perfectly landscaped grounds, the overall feeling of any guest is one of opulence and grandeur. Ensuring the experience at Da Vittoria lives up to this grand scale, all the family play a part. Bruna now oversees proceedings, with Enrico and Roberto in the kitchen. Francesco’s role is to look after the wine cellar and catering and banqueting services that the restaurant provides, while Rossella heads up hospitality for the venue as a whole. Still part of the culinary dynasty that is the Cerea family, Barbera actually runs a patisserie in the town centre, Cavour 1880, although her husband is a pastry chef at the family establishment. Still renowned for their seafood offering, the restaurant offers a special menu ‘In the tradition of Vittorio’ to celebrate fresh fish and seafood available that day. The ‘Carte Blanche’ tasting menu is the full dining experience, while those pushed for time can still enjoy the express business lunch on offer. As much an event business as a restaurant, there are regular themed evenings, banqueting events and cookery demonstrations to add to the already extensive culinary offering. The restaurant’s extensive, and priceless, wine cellar includes bottles of ‘Rosso Faber’ – a wine produced under the Da Vittorio brand to preserve the hard work and traditions of the family. Made using grapes from the family’s historic vineyard, which is lovingly cared for by Francesco, ‘Rosso Faber’ is a Bordeaux blend, made with Cabernet Sauvignon and Merlot grapes. 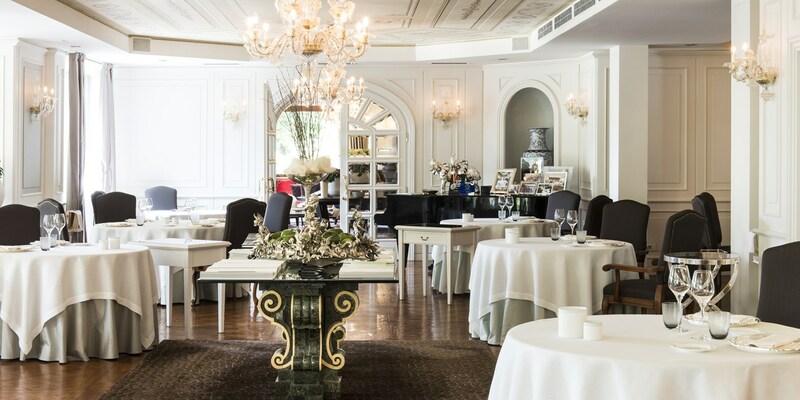 From Bergamo to Los Angeles: the Cerea family often takes its delectable gastronomic prêt-à-porter around the world. Even in the early days, Da Vittorio always stood out for the team’s skill in preparing food ‘live’. Thanks to a specially conceived portable menu, dishes can be cooked directly on site, meaning their catering and banqueting services are sought after for events around Italy and throughout the world. Enrico's favourite pastime is a round of golf, and the chef utilises his passion to arrange a yearly gourmet golf event in Bergamo, which brings together many top chefs from around Italy.